Help protect precious memories with USB 3.0 connectivity, WD Backup software, Acronis True Image WD Edition system-level backup software, and hardware encryption. 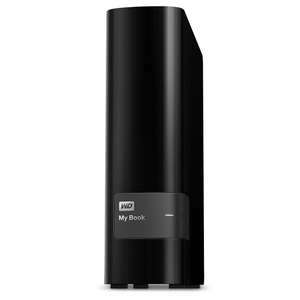 With up to 6TB of capacity, you'll have all the room to keep your favorite photos, videos, music and important files. Set a password to enable hardware encryption to keep data safe from unauthorized access. Bought one before @99, still good. Yep these are pretty decent, think I got 2 at 105 each. What’s inside of these? Are they red drives? Defo not reds, greens most likely. Do these recertifird products come in sealed packaging? really need a big hdd but by the time they come on here never no stock. Re certified usually means they take out the platter and throw it away, the only original remaining components left being the disk head and the circuit boards. Usually... so it's as good as a new one for all intents and purposes. I'm not massively keen on re certified either but I think with disks its usually ok at least not had any die any quicker than off the shelf new ones. If that worries you so much get a second basket and another 6 eggs, or have less eggs. Re certified usually means they take out the platter and throw it away, …Re certified usually means they take out the platter and throw it away, the only original remaining components left being the disk head and the circuit boards. Usually... so it's as good as a new one for all intents and purposes. I'm not massively keen on re certified either but I think with disks its usually ok at least not had any die any quicker than off the shelf new ones. Not always, it means the drives were returned for some reason, could be as simple as someone opened it and didn't like the colour, maybe a power supply failed (thats not applicable here as they are USB powered), or even the packaging got damaged as it went to the store. It could be the drive had issues and has been repaired, or maybe the internal electrons that does the USB to Drive mounting failed. Its probably not economically viable to dismantle the drive unit and repair it , if the drive itself has failed it gets replaced with another drive, but not fix the component level of the drive. Point is there are a few reasons, and there is no way to know what they were, but they should have been identified and fixed as part of the recertification. What about the warrenty man? Why would you even consider buying a second hand hard drive when you could get a new 6TB one for £20 more. only 2TB £51.99 available now. BTW new list of HDD comes every monday. so try again then. Any significant difference in performance between old and new hard drive?